This past week I've been on a short hiatus from blogging while working through some important issues offline. Luckily my feed reader helps me stay up to date on the latest Blogger news (albeit a little later than normal) and I was thrilled to see some truly awesome Blogger templates have been released in recent days. 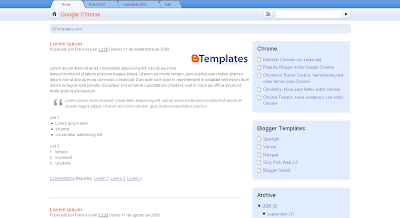 A clean, blue two column theme based on the new Chrome Browser. 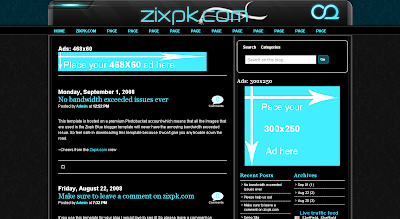 Converted from the original Wordpress theme by Smashing Wordpress Themes. I'm quite a fan of the grunge design trend, and this is an excellent example of how this style can be adapted to a Blogger theme. 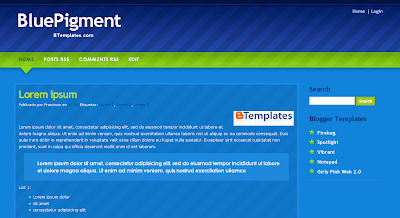 This is a one column template with three sections in the footer for your meta-content. As you can see from the screenshot, the theme is monochrome though this would be perfect for a photoblogger or designer to showcase their work. 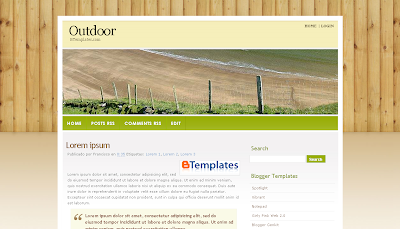 Converted from the original Wordpress theme by Arcsin. 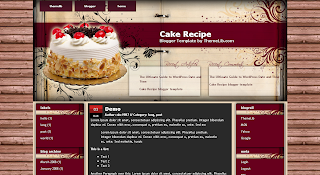 This is a stunning colorful template with two, three or four columns (depending on your customizations of the theme). It features built in feeds for your recent posts and comments, and includes spaces for 125px square ads in the sidebar. 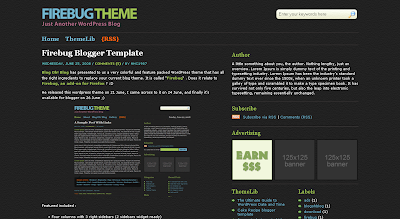 I love the background texture of this theme which is best viewed in the demo blog (the screenshot here does not convey the tru detail of this theme), and with the fully featured functions, this is an excellent Blogger template to use. Converted from the Wordpress template designed by Blog Oh Blog. This is a beautiful and feminine narrow two column theme with a fresh color scheme. 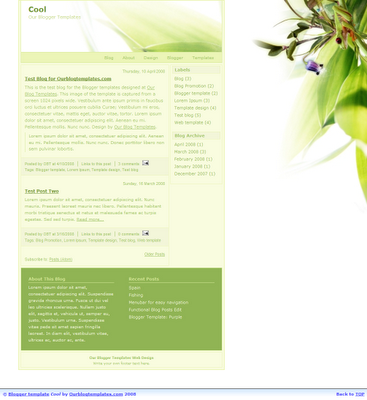 A simple though well designed two column theme, converted from the Wordpress template by Styleshout. Here is a stunning three column design which features spaces for ads, an integrated search function and navigation links below the header. A bold, colorful two column theme with integrated navigation links and stylized posts. 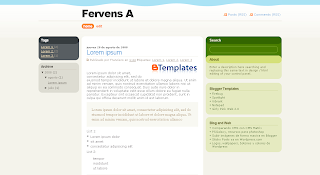 Francisco has successfully converted all three variations of the Fervens Wordpress theme by Design Disease which was created for Smashing Magazine and its' readers. All three are clean, simple and beautifully designed themes with excellent color highlighting for the sidebar widgets. This is a beautiful niche-based Blogger template which could be an ideal choice for a food/recipe blog. 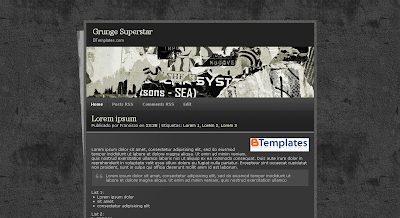 Includes three columns in the layout and widgets within the header for recent posys and comments. Converted from the Wordpress template by Quality Wordpress. 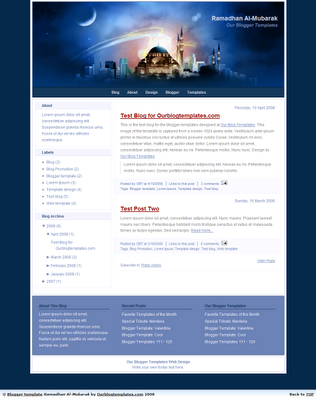 Our Blogger Templates has created a special tribute theme for Ramadhan, which includes two columns in the main layout and three sections in the footer. This is a beautifully designed template and an excellent tribute for this month of fasting. Do you have a theme to share? If you are a Blogger theme designer or would like to share a theme you have created, please feel free to drop me a line or leave a comment so I may include your theme in the next round-up on Blogger Buster. Which of these themes do you like the most? Feel free to leave your comments and opinions below.